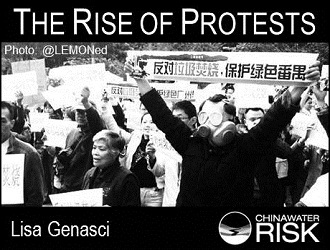 With over 500 protests daily, Lisa Genasci examines their rise and their role and impact in China today. Over the past two decades the world has outsourced industrial production to China, helping to fuel rapid economic growth, a growing middle class, growing domestic consumption, rapid urbanization and massive environmental degradation. And the country has developed a reputation as a place where factory and mine owners can operate dirty facilities with impunity. But that is clearly changing. While both China’s Central and local governments have long tried to tell citizens that the air quality in major cities is improving, food is safe and downplay water pollution, Chinese are increasingly frustrated with inaction to clean the messes and limited chance for redress. People, particularly in rural areas, are starting to take maters into their own hands, joining following web or mobile phone connections in what are sometimes violent protests. They are no longer shy to protest excessive water consumption or mistreatment of existing resources. This has ramifications for both investors looking at chemical plants, mining or other high-polluting or water-intensive industries and the plant owners themselves, who increasingly are being forced to clean up their messes or face public action. Evidence shows that the growing middle class living in rural areas and in second-tier cities wants action to protect their health and they want greater government transparency. Opinion polls show a high and growing level of environmental awareness. At the same time, health statistics paint a picture of rising incidences of cancer, stroke, diabetes and other diseases associated not just with more affluent societies but also those that are suffering from pollution. People are angry that they are sick, that their children are getting sick. Official estimates in China are that on average 500 protests occur daily across the country. That figure is in line with property rights advocacy group, Landesa’s, recent estimate of 187,000 protests last year against government land seizures, official corruption, Chinese involvement in Tibet, worker rights and environmental pollution incidents. Estimates are that there were as many as 90,000 “mass incidents” in China sparked by environmental concerns last year, according to a recent article in Foreign Policy magazine. The large majority of these incidents, of course, are not widely reported by media so accurate numbers are hard to come by. Whatever the figures, the examples of successful action against polluters are now numerous. Protests against a planned copper smelting complex, slated to be one of the world’s largest, caused local officials to cancel a contract for construction of the $1.6 billion plant in southwestern Sichuan Province earlier this month. The smelter had been planned to help revitalize the area devastated by the 2008 Sichuan earthquake by creating thousands of construction jobs. The cancelation was particularly noteworthy as the Chinese economy slips into a period of slower growth. Last month, about 1,000 people protested against a rubbish incinerator in Songjiang, near Shanghai and in December, local officials stopped a coal-fired power plant in Haimen after a protest of an estimated 30,000 people. In September last year, a solar company in Jiaxing was closed after protesters objected to chemicals used in the manufacturing process. Last August, local officials in Dalian responded to a protest of an estimated 12,000 people by announcing a petrochemical plant would be closed and moved elsewhere, although that has yet to happen. Still, as David Zweig, professor of Social Science at Hong Kong University of Science and Technology points out, most protests are generally against local rather than Central government, which has been shown in recent polls to have an 65 percent approval rating. In part, the local action reflects the belief that local protest can be meaningful and produce results. The reality is that the Central Government considers local authorities directly responsible for the welfare and livelihood of the people where they govern. But local action is expected to stay local. In Beijing, the message is loud and clear: Make sure that local complaints, particularly collective complaints, are resolved at home. Protests taken all the way to Beijing might affect the careers of local officials who refuse to act to remedy issues. Hence the strict punishment, and often detention of petitioners who try to take their complaints to Beijing. 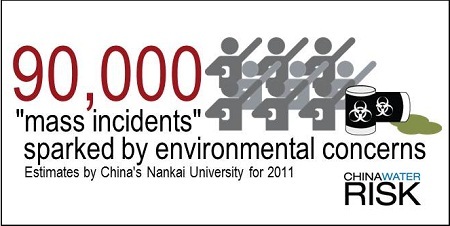 There are now many thousands of environmental NGOs nationwide in China and many of them are organized around a single issue or were established to protest excessive emissions from a particular plant or group of factories. Importantly, these NGOs clearly represent the interests of the people, who no longer believe what they are told if their own eyes and ears tell them otherwise. China, for example, has long tried to down play a worsening smog problem that in 2011 left citizens gasping for much of the year – while the government claimed 274 “Blue Sky” days. But following online citizen activism, the deployment of alternative means to measure the air quality by citizens, NGOs and the U.S. Embassy in Beijing, the Chinese government earlier this year announced it would publish readings of the small and hazardous PM 2.5 particulates. NGOs and individuals are increasingly emboldened by significant wins like this one, the promised closing of polluting plants in Dalian, Jiaxing, and Songjiang last year and other similar shutterings in response to protests around pollution incidents or concern about chemicals. But what’s interesting about the current trend, and what really sparked the protest in Dalian, was not a specific incident but worry about future impacts from the plant. And it was the local government’s failure to disclose information and efforts to stop any reporting on the real risks that fueled the anger. Both government and the corporate sector are starting to take note. China in 2008 introduced Environmental Information measures that require government agencies to proactively disclose a range of environmental information. Chinese NGOs are leaning heavily on this resource. Beijing-based Institute of Public and Environmental Affairs, Washington D.C.-based Natural Resources Defense Council and others are drawing on OEI to gain information about corporate air and water violations. IPE’s website is now populated with over 90,000 such citations. In an Environmental Information Disclosure report looking at transparency in 113 Chinese cities last year, IPE wrote that as of December 31st, 2011, a total of 548 companies had been in contact with environmental protection organizations in response to their environmental violation records. In 2011 alone, 218 companies provided explanations regarding their pollution issues and the corrective measures that had been taken. “This progress has shown that China’s environmental information disclosure has already started to push companies to re-think their environmental responsibilities,” IPE wrote in the report, co-authored with the NRDC. Interestingly, IPE and others have been allowed by Beijing to operate relatively freely using the disclosure information as they are in essence doing a job the government cannot: helping to bring change in the out-of-control drive for production and profit at any cost. The disclosure of government environmental violations data allows for citizen participation and encourages environmental criticism in local and national media. At the same time, the growth of social networking, in particular microblogs such as Weibo have helped spread the word about environmental challenges and mobilize protests against polluters. China has more internet users than any other country, with the World Bank estimating 35 percent of the population is now connected online and that number is growing rapidly. Local conflicts can, of course, damage brand image and multinational companies in particular are starting to take note, worried both about action to close supplier plants and reputational risk to association with a polluter. As China Water Risk has reported here and here, in recent months, there have been significant commitments from key players in the textile industry to encourage less polluting production by their supplier mills, largely in response to action by environmental groups. Patagonia in recent months took an even bolder step forward, announcing that it was refashioning itself under California’s new “benefit corporation” designation (B Corp). This creates the legal framework for Patagonia and other companies to reinforce their social and environmental goals. As a B Corp, a firm must have an explicit social or environmental mission, as well as a legally binding fiduciary responsibility to take into account the interests of workers, the community and the environment as well as its shareholders. China Water Risk has written about the company’s environmental initiatives here. Peter Gleick points out in his Biennial report on Freshwater Resources, “The World’s Water” that as public understanding grows of the impacts of excessive water usage or chemical discharge on ecosystems and local communities, company water practices are being subjected to greater scrutiny. Major media outlets now frequently cover water-related protests, while investors are also increasingly making decisions based on which companies are adequately addressing water-related risk. This is certainly an instance of polluting companies beware!